All former and current affiliates may upload original content they have produced at Kyoto University (with the consent of all co-authors). This contest will remain public even if the author's affiliation changes. The repository accepts academic output and intellectual products generated by research or educational activities at Kyoto University. This includes academic journal articles, degree dissertations, papers in academic bulletins, scientific research grant reports, survey reports, preprints, technical papers, conference presentation materials, speech and symposia presentation materials, lecture transcripts, and teaching materials. In particular, depositing degree dissertations, grants-in-aid for scientific research reports and conference papers are highly recommended, because they are not easily accessible due to their limited distribution, even though they are valuable academic and scholarly output. Process and obligation of deposit depend on content type. Please check below. Journal article after April 28, 2015 Open Access Policy KURENAI Deposit System "Kyoto University Open Access Policy" mandates faculty members to publicize in principle their academic articles after April 28, 2015 on the Internet by depositing them in "KURENAI". Dissertation after April 2013 Degree Regulations (MEXT) Ask the relevant section of your graduate school about the procedure Doctoral recipients after April 2013 are obliged to provide full-text public access for their dissertations. Other product Registration Form The repository accepts academic output and intellectual products generated by research or educational activities at Kyoto University. Obtain permission from each co-author in advance. 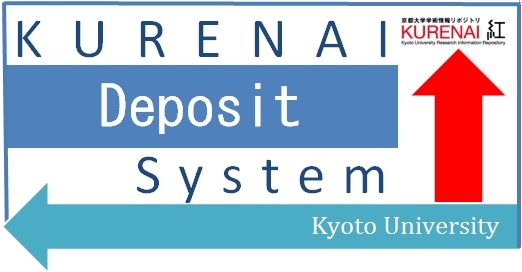 Login "KURENAI Deposit System" (SPS-ID required) and deposit your article referring to the KURENAI Deposit System manual. *If you can't use "KURENAI Deposit System", please apply on Registration Form. Doctoral recipients after April 2013 are obliged to provide full-text public access for their dissertations. Please ask the relevant section of your graduate school about the procedure. Send the information of the following two points to the Library. Please send this form with your signature or seal by email (PDF file) or by post. If you send it from e-mail addresses with the Kyoto University's domain name (kyoto-u.ac.jp or kyoto-u.jp), your seal or signature is not required. Undergraduate and graduate students are required to include their faculty research advisors' e-mail addresses with the Kyoto University's domain name in CC. Please send the version of the article that the publisher permits. If you are not sure the publisher's policy about self-archiving, please send the author's final manuscript. - Publisher version; the Library will retrieve the publisher version from the publisher's website. - The version already publicized in a preprint server or a similar public sites: please notify the URL. PDF format is recommended for maximum security, though the Library accepts any format. The Library will combine the main text and charts into a single PDF file, if they are submitted in separate files. To submit a large-size electronic file or multiple content: Send a copy on appropriate media, such as a CD-R disc, by intra-university mail, etc. If you only have a print copy: Send a print copy by intra-university mail, etc. The Library will scan it into a digital format. The Library will re-check and confirm publisher's policy about self-archiving. The Library will deposit and publicize the article in KURENAI.